1 Step 1 – Right-click anywhere on the page and click on Inspect. 2 Step 2 – Click on the tablet icon that is second from the left. 3 Step 3 – Shows “responsive” as the selected choice. 4 Step 4 – Then the screen shows 90%, and if you click that area and then it shows a “Fit to Window” option. You can select that. Nothing But Instagram! Why in the world Instagram does not allow us to upload photos or videos to our profiles from the desktop site? The answer is quite simple – In the name of encouraging people for mobile use of the app and engagement with other users. How Nice & How Easy! How time-consuming it is to post manually from desktop to phone all that content taken or filmed on cameras, What A Task! Since most of the social media platforms are built to work on both smartphones and personal desktop computers, quite easy it is to post photos on social media with a mobile phone. Why would anybody want to upload photos to Instagram from a PC at all? Mostly because of the quality of the photos. For most people, a traditional DSLR (Digital Single-Lens Reflex) camera is our top choice. It’s a hassle to upload and download Instagram photos and videos, especially if the files are large! The uploading process of DSLR photos to Instagram is a hassle itself – All photos to be edited and uploaded from your PC to Google Drive or Google Photos (or some other sharing service), then download them to your phone, then upload them to Instagram, Even More, Than Time Consuming! When you log in to your Instagram from your computer, your feed and profile will look similar to the phone but you won’t have the option to upload the image. A lot of people look at this and assume that you cannot upload the photo on Instagram from a PC. But, that’s not completely correct. There’s a way around it that’s going to make this task in hand possible for you. When entered into the Instagram account from your computer, but your feed and profile would look similar to the phone except for the upload image. On the phone, you can see the upload image but on the pc, you can’t see that image, but you won’t have the option to upload the image. This causes people to think that uploading photos to Instagram from PC is not possible, but it not completely correct at all. There are ways of making it possible. Although there are a few ways, let us start with the Chrome method since it is the most popular and widely known. Chrome browser has a 65 percent share of the browser market, followed by Safari with 15 percent. 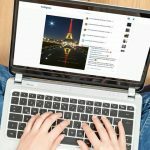 So, while there are other workarounds for posting to Instagram from PC or Mac, this one will allow almost 80 percent of internet users to perform the task via desktop or laptop. Compared to others, since Chrome has the biggest portion of the browser user market, we first and foremost start with analyzing the Chrome Method. 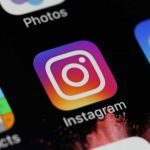 There are many other third-party apps on the market that promise to help you auto-schedule Instagram posts from your PC, however, all of them are bound by the conditions that Instagram imposes. In this sense, we say much better it is to hang around with Chrome method. 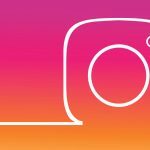 Uploading Photos on Instagram from PC (Windows/Mac) without any app – On the PC, first, open Instagram and log in. In the browser window itself, from an anywhere right click with your mouse and select “Inspect” at the bottom of the drop-down menu that appears (or CTRL, SHIFT, I – capital letter i on the keyboard). Doing this will open the code inspector tool within Chrome. All of the core contained on the right is to be ignored. The “Inspect” option will split your screen so you have the Instagram account on the left side and the code base on the right. It can be confusing to look at as there is a lot of code and other data there on the right side. Step 1 – Right-click anywhere on the page and click on Inspect. Again, ignore most of that content and check for the top of that Inspector window and a little icon resembling a tablet – a phone will be seen easily right there (in the screenshot below you will see a red circle with a numeral 1 in it). On devices which Steps 2 through Steps 4 cannot be seen, please click Continue or Next button. On the right side of your browser, you will see Inspect elements. Step 2 – Click on the tablet icon that is second from the left. Step 3 – Shows “responsive” as the selected choice. Click that and the drop-down menu shows a bunch of different phone or tablet options. You can pick the one closest to your device. On clicking the tablet icon, you will be able to see options on the top of your Instagram page. There are multiple options available like Galaxy, Pixel, iPhone, iPad. You can select any option that’s convenient for you. We have selected iPhone 6/7/8 Plus in the example below. Step 4 – Then the screen shows 90%, and if you click that area and then it shows a “Fit to Window” option. You can select that. Each time, your screen may shift slightly, but it is normal. If you do not select a smaller option, your screen may not show the bottom of the Instagram app screen and there is no way to scroll from this “Inspect” developer window. In this step, a screen shows up that closely resembles (or matches) what you see on your Instagram mobile app – with the usual plus (+) sign at the bottom that allows you to take or select a photo from your phone gallery. (If you do not, scroll down to the note below.) If you click it here in Chrome, it will open a dialogue box to open a folder on your computer where you can select the photo and upload it. Then you will see the remaining standard Instagram screens – the edit screen where you can move the image and select the part you want to use. After clicking “next” you land on the share page which allows you to add “write a caption” (or not) and click share. After selecting your option, refresh the page. 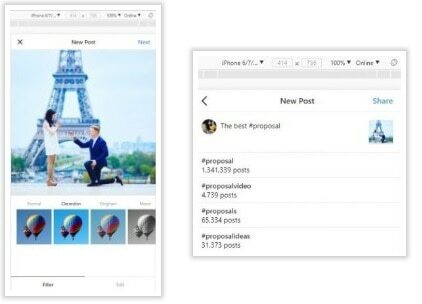 Now, your computer’s Instagram page looks exactly like your mobile with an option to add an image. In case you do not see the plus (+) sign at the bottom, as you do on this screen, simply refresh the browser window (F5 on a PC keyboard) or the reload button to the left of the address bar. This usually reveals it for the times when it does not appear instantly. If you do not have the Chrome browser on your PC or MacOS, then you could try using HootSuite (an online scheduling tool for social media) or BlueStackApps (which is an emulator similar to what we are doing here in Google Chrome). 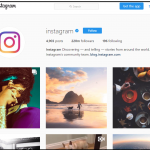 There are many other scheduling tools on the market that promise to help you auto-schedule Instagram posts from your PC, however, all of them are bound by the conditions that Instagram imposes. So in this sense, it would be much better to stick with the Chrome method and go with it. 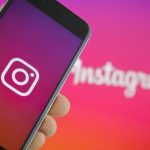 Bir önceki yazımız olan How to Get Back Hacked Instagram Account başlıklı makalemizi de okumanızı öneririz.